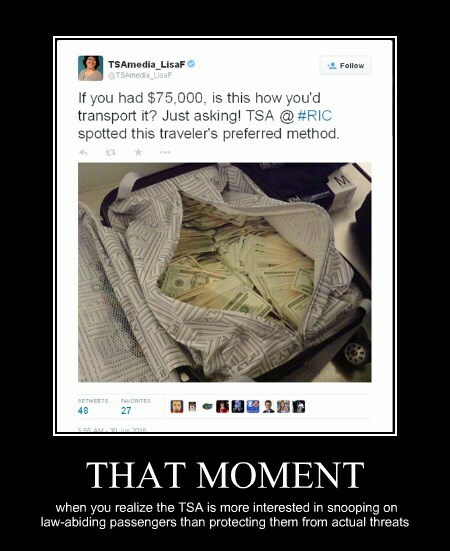 Security Memetics: "These Fat Stacks Of Cash Could Hurt Someone"
As has rightly been asked by multiple other people, what other perfectly legal personal (possibly embarrassing) items does the TSA take pictures of and share on social media when they're rifling through your belongings? And this is just the things they're willing to show the public - what kind of pictures are they sharing amongst themselves? I'm pretty sure you can't bring down a plane with dollar bills, so the TSA's interest in this is disturbing.